New Year’s is one of the best times of the year when one can relax with family and friends. But for those who prefer to go out and enjoy the festive season, there are numerous exciting events going on. Here are some ways to spend quality time in Tokyo during the New Year’s holidays. 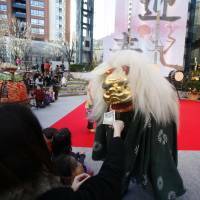 On Jan. 1 from noon to 3 p.m., there will be wadaiko (Japanese drumming) and shishimai (lion dance) at the Roppongi Hills Arena. From 1 p.m., furumaizake (New Year’s sake) will be offered to the first 200 visitors. 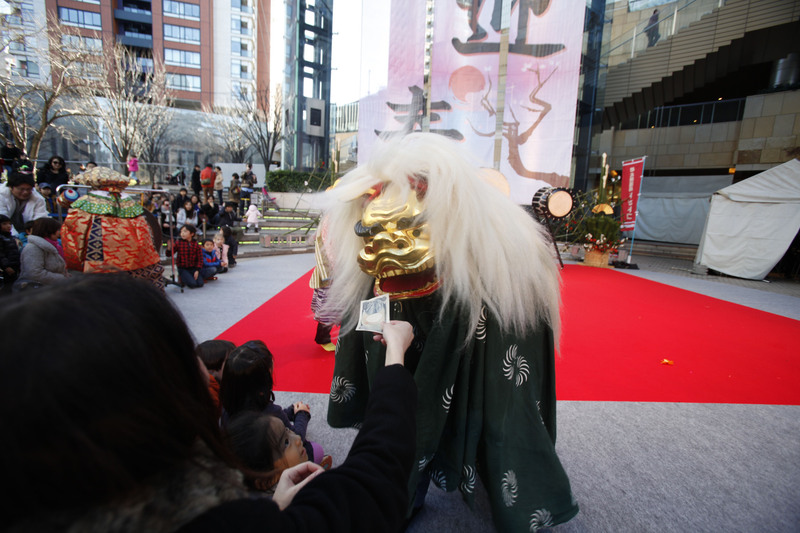 On Jan. 2 and 3, from 11 a.m. to 4 p.m., in addition to wadaiko and shishimai performances, people can enjoy listening to and playing koto and traditional Japanese games, including kendama (a Japanese ball-and-cup toy) and otedama (beanbags), for free. There will also be a workshop where guests can make furoshiki, a square cloth that has long been used in Japan for wrapping, storing and carrying items. From New Year’s Day to Jan. 3, fuku gohan, or good luck menus, will be offered at 14 restaurants in Roppongi Hills. Between Jan. 1 and 15, many shops in Roppongi Hills will hold a winter sale with discounts up to 80 percent, while about 70 shops will offer fukubukuro, or lucky bags, each packed with stylish clothes and miscellaneous goods. The bags are usually on sale from Jan. 1 to 3. Additionally, the trees that line Keyakizaka Street are illuminated with 1.2 million lights between 5 p.m. and 11 p.m. through Feb. 14. Various events will be held at Tokyo Skytree through Jan. 8 to celebrate the fresh start of 2017, including a strength competition and a photo session with a sumo wrestler at the 350-meter-high observation deck between New Year’s Day and Jan. 3. 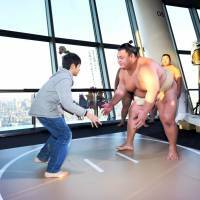 There is also furumaizake served by a sumo wrestler on Jan. 1 on the first floor of Tokyo Skytree Town. A shodo (Japanese calligraphy) exhibition will be held at Tokyo Skytree Town, and a kakizome (first calligraphy of the year) workshop will take place at Tokyo Solamachi, both on Jan. 2 and 3. There is also a skating rink on the fourth floor of Sky Arena until March 5. Additionally there will be sales at many shops with discounts up to 70 percent, and street performances will be held from New Year’s Day until Jan. 3. Taruzake, sake poured straight from a wooden cask — will be offered to guests for free on Jan. 5, at noon and 5 p.m., at the entrance of the Japan Sake & Shochu Information Center in Shinbashi. The first 200 guests will receive a masu, a small wooden box that sake is served in, with a rooster carved on it. Some people are said to collect the masu every year as lucky charms and have masu collections of all 12 Chinese zodiac animals. Kagami-biraki, or sake barrel opening ceremony, will be performed on the day for visitors to celebrate the new year together. For more information, visit www.roppongihills.com. Tokyo Skytree Town is connected to Tokyo Skytree Station (Tobu Skytree Line) or Oshiage Station (various lines). For more information, visit www.tokyo-skytreetown.jp/english. The Japan Sake & Shochu Information Center is three minutes from Toranomon Station on the Tokyo Metro Ginza Line. For more information, call 03-3501-0108 (Japan Sake and Shochu Makers Association, PR Department), or visit www.japansake.or.jp/sake.